Heat Pumps are a very efficient way to heat and cool a home unfortunately most window units require 220/240 volts to operate. While 220/240 Volt electrical lines can always be installed this can add to the cost of installing a heat pump unit. With most outlets wired for 110/115v a unit that matches this voltage is often the only choice. With this in mind there are some 110/115 Volt heat pump window units available. 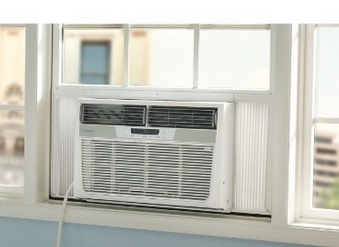 The Frigidaire FFRH0822R1 is a 115 volt unit that puts out 8000 BTU cooling and 7000 BTU for heating. While all window units make noise it is quieter than many other units and works very well. It will need a 20 Amp breaker to run from which is common in most living rooms and bedrooms. Frigidaire is a well known HVAC manufacturing company with a good reputation and warranty on their products. The Honeywell MM14CHCS is a portable heat pump that has a hose connected which feeds out a window. This is a unit that would be easier to setup as a hose is simply fed outside to pump out hot or cold air. It is also not a permanent fixture and can be easily carted away to a closet. Amana make this 115 Volt unit that is rated at 9,000 BTU. It has a SEER rating of 10.4 that while not as good as other option is expected for a pre-setup all-in-one package. Although most window heat pumps are 220 volt units there are a few that are dedicated to 115 volts. Keep in mind other electronics that may be on the same circuit as the outlet you plan to use. Units like that above are likely to draw 10-20 amps. If there is other electronics on the same circuit breaker it will flip off if the amps are exceeded. One way to tell what outlets are on the same breaker is to plug into the outlet with a electronic device such as a radio and turn the breaker off. Other electronics on the breaker will also go off giving you an idea what is being used. Also heat pumps have a low temperature rating which they can work and pump out heat at. This can vary from unit to unit. Most heat pumps can work down to 20 degrees Fahrenheit without much problems. Below this and the outside condenser can begin to ice up. When this happens most will use heat strips which work like big space heater to send out heat. If the temperature does drop low enough for the heat strips to come on it should only be temporary while the condenser become unfrozen.